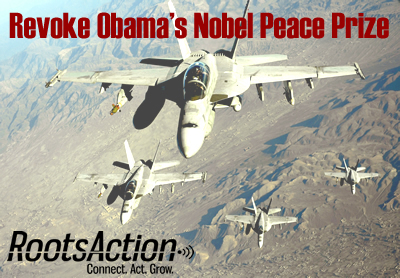 After receiving the 2009 Nobel Peace Prize, President Obama has made perpetual war look more perpetual than ever. Today, there are more U.S. troops in Afghanistan than when Obama took office. His increasing intervention in Syria promises the loss of even more than the nearly 100,000 lives already needlessly sacrificed. His intervention in Libya cost thousands of lives while destabilizing the entire region. His presidency has widened the use of drones and other instruments of remote killing without limit to almost any place on the globe. 28539 11 months ago Sonya Marshall Glen Burnie , MD , US He did nothing to earn it. 28535 11 months ago Anonymous Pflugerville, TX , US He did not do anything deserving for the Nobel Peace Prize. 28532 12 months ago Michael Carr Newcomerstown, OH , US He did absolutely nothing to get the Nobel Peace prize, take it from Obama and give it to president trump. 28530 12 months ago Robert Goldschmidt It's not a valid award because he never lived up to the criteria he was awarded door. 28529 12 months ago Anonymous There are endless reasons why this man should not have the Nobel Peace Prize. Makes winning this prize a joke! 28528 12 months ago Ven Andreyuk San Marcos, CA , US He is not worthy of Nobel Prize! 28525 12 months ago Anonymous Jackson, OH , US He never should have been given the prize before he did anything. He divide the world did not promote peace at all. Take it away . 28521 1 year ago Peter Yoo His winning of the Nobel Prize cheapens all other previous and future recipients of the prize. 28520 1 year ago Sheryl Musfelt Salina, KS , US Treasonist don't deserve the Nobel Peace Prize. 28519 1 year ago Anonymous Banba, SD , US It was a RACIST award. Plain and simple.